Mainstream media reports usually expound about superpowers America and Russia’s warfare engagements on various offshore fronts, the USA able to deploy 1,400,000 Active Military Personnel to match Russia’s 766,055 of a similar status soldier. Records tabulate America’s annual defense budget averages US$581,000,000,000, against Moscow’s US$46,600,000,000. Subtly the State of Israel operates the most technologically advanced military. Israel is the Goliath of high-tech weapons exports, with sales worth US$6.5 million generated yearly. The Israeli Defense Force (IDF) was first to use drones in combat operations. In 1969 IDF operators flew toy airplanes, with cameras glued to their undercarriages, along the Suez Canal while conducting surveillance on Egypt. In 1982 an IDF aerial drone called “Scout” found and neutralized Syrian anti-aircraft missile systems. Since 1985 Israel was the world’s largest drone exporter, 60% of the global market supplied by Israeli companies. Despite its relatively small geographic size of 8,019 square miles, Israel allots 4.5 % of the Gross Domestic Product (GDP) to Research & Development (R&D), 30% assigned to the military kit. Comparatively, America designates 17% of R&D to its military, Germany only assigning 2%. Israel’s main drone customers are Australia, Brazil, France, Germany, Russia and South Korea. America has the second highest drone exports, with less than 25% of the market share. Israel supplied the US Navy with its first aerial drone called “The Pioneer”, this unmanned American aircraft of Israeli engineering responsible for several Iraqi soldiers’ surrender during the First Gulf War. In 2010 five NATO countries conducted security operations in Afghanistan piloting Israeli made drones. The “Heron TP,” Israel’s largest aerial drone, has a wingspan akin to the Boeing 747 jetliner. Its airborne time is twenty-four hours, with the capability of launching air to ground missiles. The aerial drone can additionally transport a one ton payload. 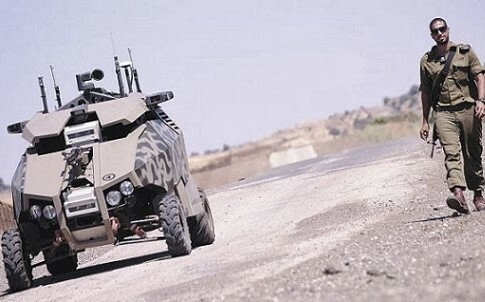 The introduction of IDF’s state-of-the-art robotic weapon, or “Unmanned Ground Vehicle” (UGV), gave Israel’s R&D specialists bragging rights, Israel being the first country to replace soldiers with robots on assignments such as border patrol. “Guardium” UGVs are deployed along the Israel/Syria border, north of the Gaza Strip. The unmanned vehicle is equipped with a variety of electronic sensors, cameras and lethal firepower. Continuous Palestine/Israel armed conflict, evolved from a two state solution, is aggravated by tunnels extending from the Gaza Strip bordering Egypt. Patrolling Guardium UGVs are driven by IDF soldiers sitting in command centers miles away from the danger zone. Hezbollah is the most heavily armed, trained and capable fighting force threatening the State of Israel. The IDF’s Brigade 300 is tasked with protecting Western Galilee from threats posed by Hezbollah to northern communities such as Nahariya and Avivim.